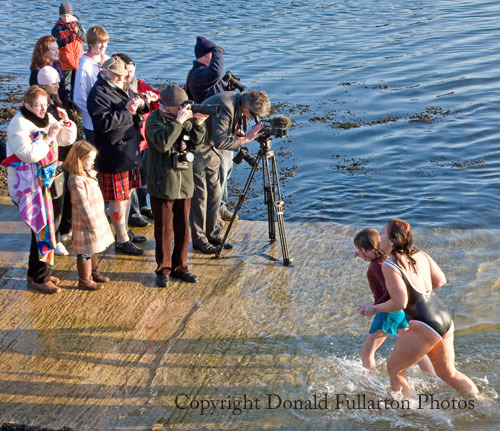 A record number of swimmers took the plunge at Helensburgh's annual New Year's Day Swim. Some 205 swimmers received the famous 'Many are cauld but few are frozen' certificates after taking part on a cold but bright sunny morning at Rhu Marina at noon. Over 154 cups of hot soup were served to swimmers by the ladies of the local RNLI committee, and a good attendance of spectators donated a record £974 for RNLI funds. The event was organised as usual by Provost Billy Petrie, his wife Jean, and members of their family. The swimmers came from several countries, including America.